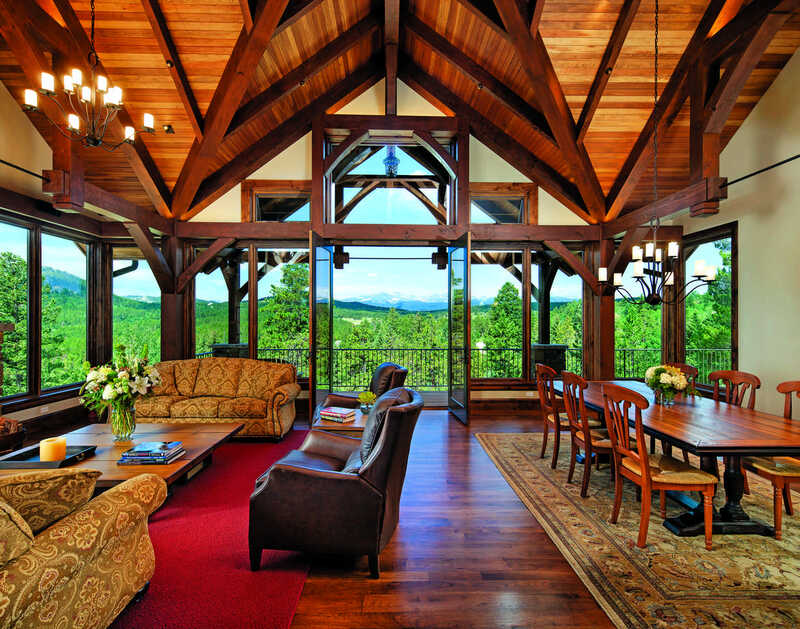 A California couple trades their suburban lifestyle for a timber home in the Colorado Mountains. A California couple trades their suburban lifestyle for a timber retreat in the mountains of Colorado. Talk about making a grand first impression! 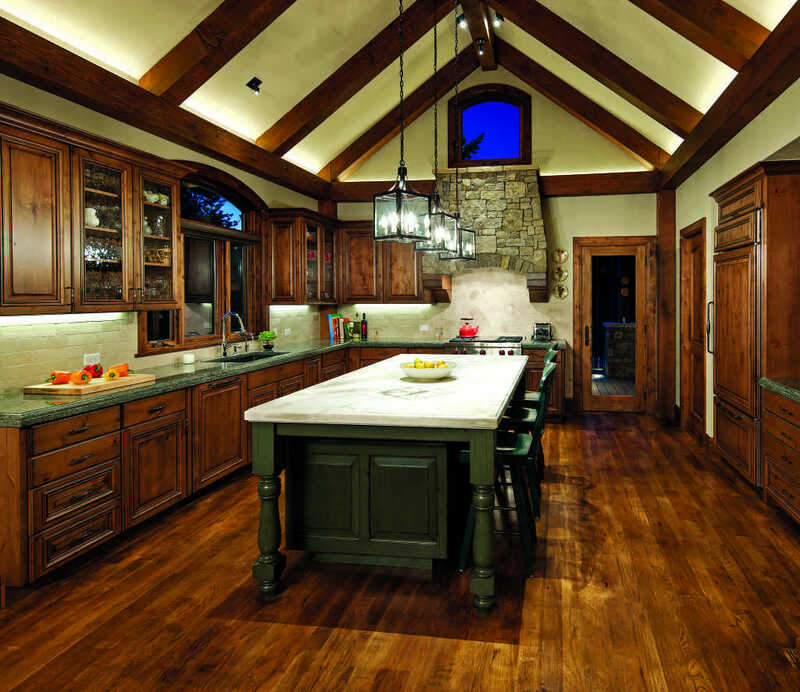 A custom 10-foot door made of African mahogany is offset beautifully by natural veneer stone from Telluride. After spending their entire lives in the suburbs of northern California, Jim and Kathy Polizzi were ready for a change. When their oldest son relocated to Colorado, the couple started to think about heading to the mountains themselves. 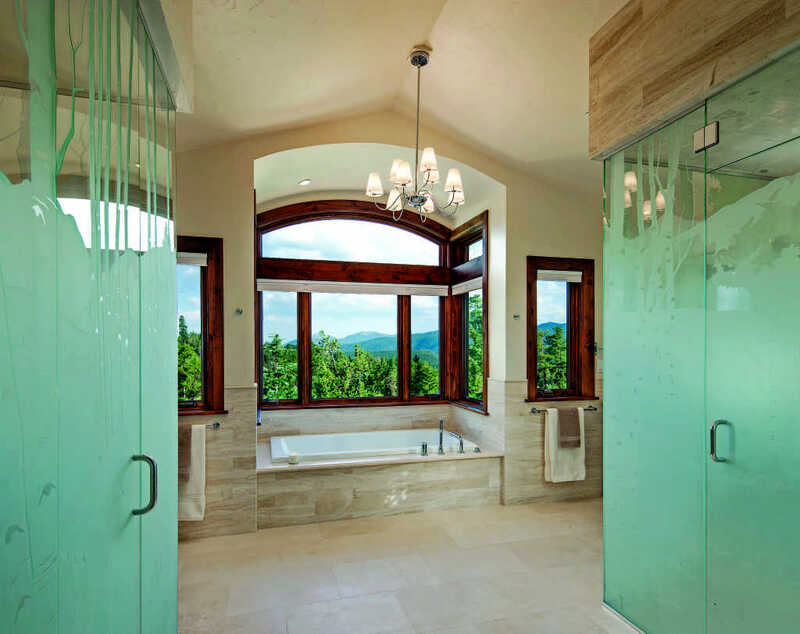 One of the home’s most compelling details is the incorporation of oversized Marvin windows that create a panoramic 260-degree view of lush forestland and snow-capped mountain peaks. To begin the journey, Jim started to search for mountain properties online. He compiled a list of potential spots to visit just outside of Boulder, but in the end, the couple found their dream site just by driving in the area and discovering a “for sale” sign. 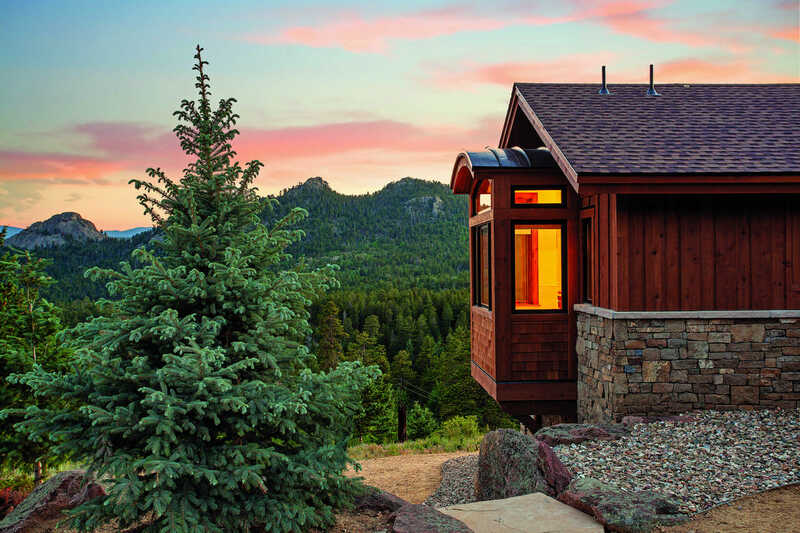 “We wanted to find a mountain location with some acreage, some distance between neighbors, plus views of the mountain peaks to the west where we could enjoy sunsets,” shares Jim. “We wanted to be somewhat remote but still close enough to benefit from the amenities of a city.” The 13-acre site they discovered near Nederland more than fit the bill. 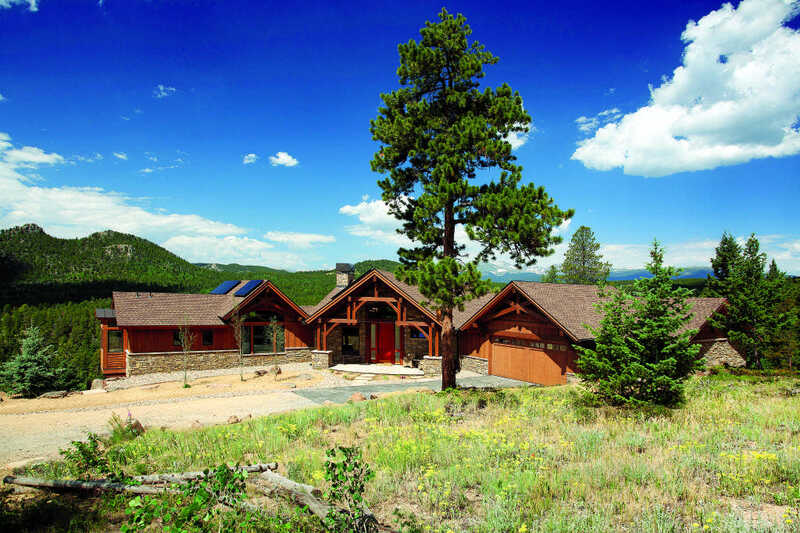 Located in the Roosevelt National Forest, the property rises slightly above on a hillside, which opens up to expansive views of the Continental Divide and Indian Peaks. “It’s exactly what we wanted,” says Jim. 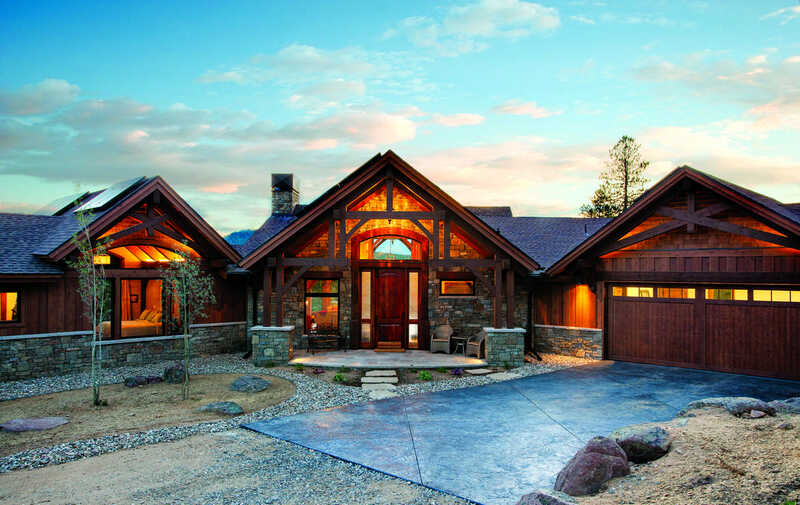 Set at an elevation of 8,000 feet, the Polizzis’ Colorado timber home affords breathtaking views of the Continental Divide and the Indian Peaks. To turn their ideas into reality, the Polizzis worked with two Lafayette-based companies: Colorado Timberframe and Cornerstone Contracting, owned by brothers Keenan and Tirion Tompkins. Cornerstone served as the general contractor, and the company outsourced the design to architect Mark Ford of Mosaic Architects of Boulder. “Our architect did a great job of bringing our ideas together,” says Jim. The resulting plan encompasses nearly 3,600 square feet of living space plus an 800-square-foot garage and workshop. The primary living area — great room, kitchen, master suite — is located on the main level, while several extra bedrooms, bathrooms and a family room are found on a lower walkout basement level. “The design is completely different from our suburban home, which was a standard, compartmentalized tract home featuring stud framing and stucco,” says Kathy. 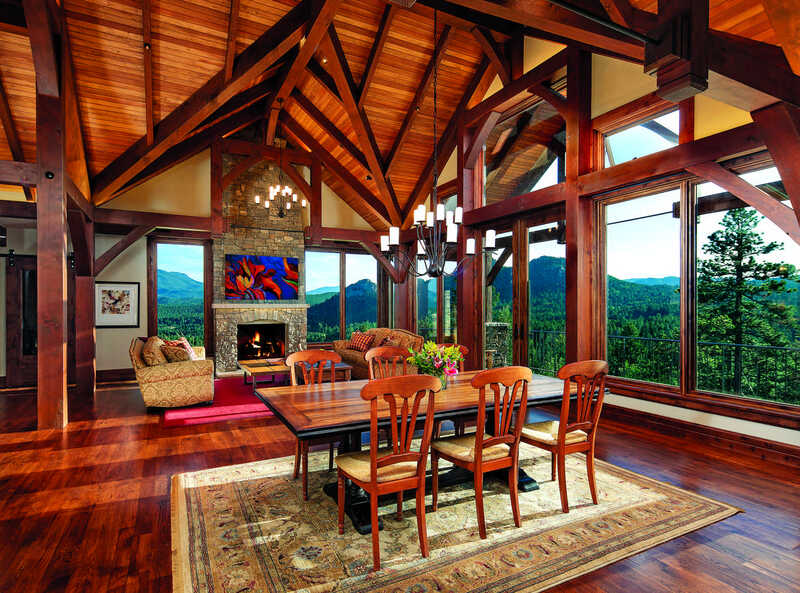 A special hallmark of the home is its incredible energy efficiency. The entire home is heated with in-floor radiant heating, plus there’s a solar PV system that allows the Polizzis to live off the grid for most of the year. “We have great solar exposure, and we sell back unused, generated electricity to the power company — our electricity bills are less than $8.00 per month,” says Jim. The home boasts plenty of other show-stopping details, from custom barn doors and etched shower glass, to motorized shades with a special hideaway recess pocket (designed by Colorado Timberframe) that is notched into the beams. The lighting is also noteworthy — strips of LED lights atop the timbers cast a warm glow to the interior and light up the beautiful frame.